How do champions think and what do they do to achieve greatness in their careers and in life? What are their mindset and habits? And what advice would they give their 21 year old self in order to launch successfully? 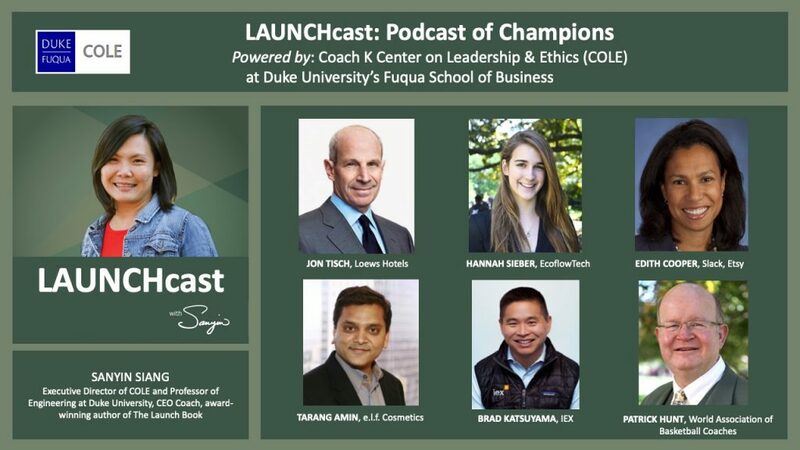 The Fuqua/Coach K Center on Leadership & Ethics (COLE) is excited to announce the launch of its first-ever podcast – “LAUNCHcast: Podcast of Champions.” Hosted by COLE executive director, Sanyin Siang, the podcast shares stories that provide insight on the “Champion’s mindset” — people who aim to be the best in their fields and the best version of themselves, without compromising what matters in life. Each episode will feature an in-depth insight interview with a champion and their personal stories. How do long-term goals, relationships, and character play a role in their success? The series will give those who are starting out their careers the tools to launch them to life-long wins. Join us with the links below! Subscribe here to receive updates, articles and a chance to ask your questions to future guests! Sanyin Siang is the Executive Director of COLE, a CEO Coach, and Professor at Pratt Engineering. Sanyin is also an advisor for Google Ventures, J&J’s JLABs, and Sports Innovation Lab. A 2X LinkedIn Top Global Influencer, her ideas have been featured in NYTimes, Fortune, and the Wall Street Journal. Her interviews can be found on her Forbes Blog. A proud double Dukie, she wrote The Launch Book for her students and her children. Find out more about this season’s LAUNCHcast guests.